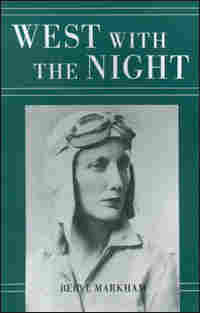 Out Of Africa And 'West With The Night' Author Anne Cherian was 24 when she first read — and was enthralled by — Beryl Markham's autobiography West With the Night, a beautifully written retelling of the aviator's childhood in Africa and her daring solo flight across the Atlantic. Ask Americans to name the pioneers of transatlantic flight, and many will come up with Charles Lindbergh and Amelia Earhart. But there were others who dared to fly that great distance, and I think the most intriguing member of those early record holders was Beryl Markham. Markham was a colonial child, born in Britain and raised in Africa, where she met Ernest Hemingway on safari and was rumored to have had an affair with an English prince. She took up flying at a time when most people hadn't even seen planes, became the only professional pilot in Africa and, in 1936, accepted a challenge to fly solo across the Atlantic Ocean. In early September, Markham set off from England in a tiny turquoise-and-silver plane filled with good luck gifts. She flew for more than 21 hours, survived a crash-landing on an island near Nova Scotia and went on to write her autobiography, West with the Night — the title a reference to the fact that she mostly flew in the dark. I read her book at age 24, while flying in a plane west from India to begin graduate studies in the United States, and I was immediately — and forever — enthralled. Markham was a woman who wrote about the moments that meant the most to her: hunting barefoot with the Nandi as a child, training race horses, scouting elephants in Africa and, of course, making that daring trip across the Atlantic. Initially, what intrigued me most about West with the Night were the vignettes of her childhood. Growing up in India, I was used to reading stories by Western authors about landscapes and food I did not know. But here was a young girl whose childhood I could easily imagine, for she too had played with servants, spoke a different language outside the house and killed animals — wild pigs in her case, snakes in mine. Then there was Markham's portrayal of Africa. Having read foreigners' accounts of India (like Africa, conquered and exoticized), I am quick to sense whether a tale is authentic. And Markham's was exactly that, told with intimate knowledge, understanding and, most importantly, love for a place and its people. Markham wrote "there are many Africas," but she described the "soul of Africa, its integrity, the slow inexorable pulse of its life ... that no outsider, unless steeped from childhood in its endless even beat, can ever hope to experience." Africa, she said, could be "mystic ... wild ... a sweltering inferno ... a photographer's paradise ... a hunter's Valhalla ... an escapist's Utopia" — but to her, it was "just home." Markham was a woman who went after what she wanted and gave it her all. Her horses won races, and she parlayed the aviation skills she learned as a bush pilot into a dark flight across the Atlantic. And when she sat down to write her memoirs, she produced a dazzling book. I still have my first copy of West with the Night, now frayed, the pages yellow with age. I read it for the simple beauty of its language, for the vivid depiction of Africa and for the amazing adventures of a woman ahead of her time. I also reach for it whenever I worry that my youthful dream of being a writer is as foolish as reaching for the stars; it is always comforting to read about a woman who sat in a small plane, suspended between earth and sky, simply because she wanted to — and because she could. You Must Read This is edited and produced by Ellen Silva. Intern Lauren Evans contributed editorial assistance.